If you ask senior living professionals, current residents or their family members, they’ll likely tell you that the social opportunities available in senior living are life-changing. In fact, before moving to a community, many older adults experience different degrees of loneliness and isolation. Everything changes when they make the move to a senior living community filled with neighbors of the same age-group and friendly, compassionate staff members who build meaningful relationships with residents. Although the opportunities for engaging in an active social life and making friends are plentiful, that doesn’t always mean the process is easy for everyone. 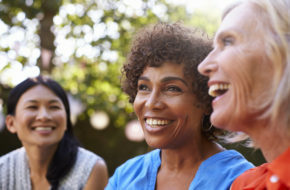 Many older adults, in fact, may find they’re out of practice in making friends. By the time we reach retirement or decide on a maintenance-free lifestyle, we often assume that our most meaningful relationships have already been made. New residents sometimes go into senior living with the mindset that other residents will be nothing more than neighbors, friendly folks to say good morning to and chat with at the barbershop or hair salon. However, at Diakon Senior Living, we find that residents often form strong, long-lasting friendships with fellow residents. In our communities, residents truly share life together. They share meals, attend events together and take on leading roles in one another’s lives.